We spend a lot of time on Bayou Fountain maintaining our premiere paddle trail, but sometimes our help is needed elsewhere. This time, it was the Comite River at Waddill. 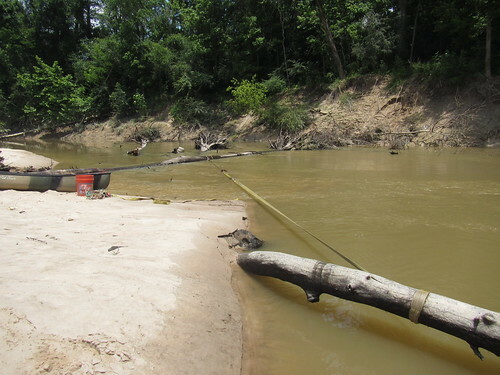 We’ve been interested in Waddill for a while, as it provides an access point on the Comite River about seven miles downstream of BREC’s Blackwater Conservation Area off Hooper Road. 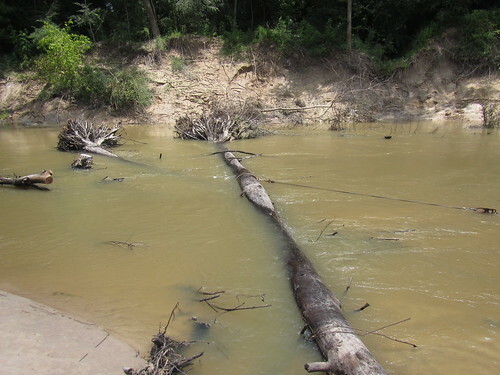 Recently, we were talking to someone from Waddill about paddling access there, and they noted that there was a fallen tree across the Comite right in the area of the access point. 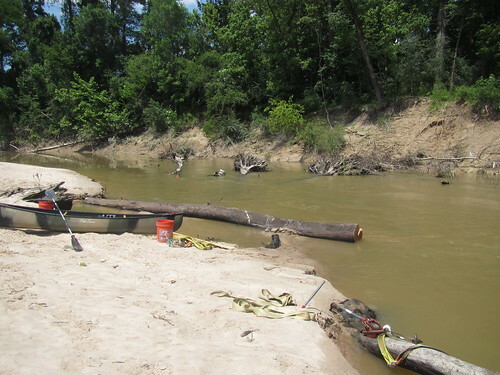 We’re practically made for dealing with wood in the water, so we said we’d come out and see what we could do. There were only two slight problems. The first problem was that our “regulars” for PaddleBR paddle trail maintenance pretty much all have “real” jobs on weekdays and tend to be on Bayou Fountain on Saturdays, and Waddill is closed on Sundays. Fortunately, a couple of us shift to Monday through Thursday during the summer, so Fridays opened up… as did the heavens. It’s hard to work on a tree when the Comite’s several feet too high. 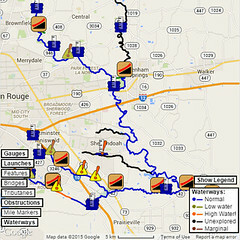 It took a while, but finally schedules and water levels aligned, opening up Friday for an assault on the tree. We hadn’t seen photos in advance, so we didn’t know exactly what we would find. When we arrived on site, the scope of the job became a bit more clear. There were several trees down but only one obvious problem tree, and it was impressive. 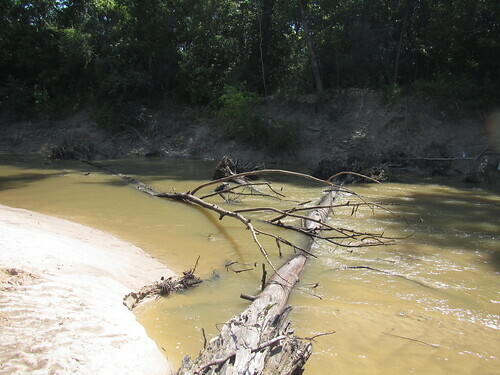 It reached most of the way across the Comite with the top end right at the near bank, and it was thick. It’s possible to saw a tree trunk that’s wider than your saw is long, but it takes a bit of additional thought and effort. Cutting a large enough notch in the top that the saw could reach all the way through was just the first part (with multiple cuts at various angles gradually deepening and widening the gap). Once there was a decent notch, the sawing in earnest could begin. You cut a bit from one angle, then switch angles or hands or directions as you get tired. The current had washed out quite a bit of sand from under the tree, so it was not a matter of just standing and sawing. It was much more fun than that. Every so often you need a break, so the “breaks” were cutting off more and more pieces from the smaller-diameter selections. After two hours of work, the cuts seemed to be sufficiently through the trunk to start phase two. With the cuts virtually through the trunk (and likely overlapping, as you never quite stay planar when cutting from multiple sides and angles), out came our trusty heavy tackle. A conveniently embedded log/trunk made for a convenient anchor point for one end of the pull, and a short strap around the trunk completed the set. Let the winching begin! 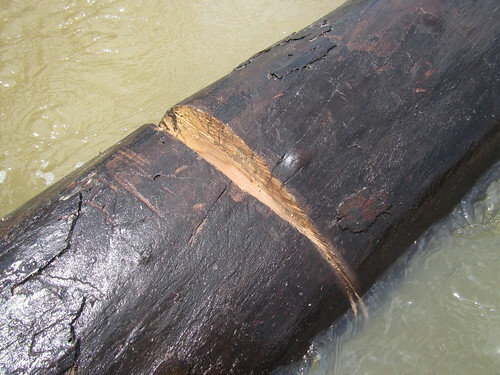 Almost as soon as the tension was fully on, there were cracking noises, and shortly thereafter, the trunk separated with the half on the root ball side of the cut immediately plunging to the bottom with a tremendous splash. Then it was just more cranking to pull the free half around to the bank. It took 2-1/2 sets to completely pull the free end around to the bank, clearing the way for a wide open path. Of course, that was not the end of the work, as there were tops of several fallen trees just below the surface. 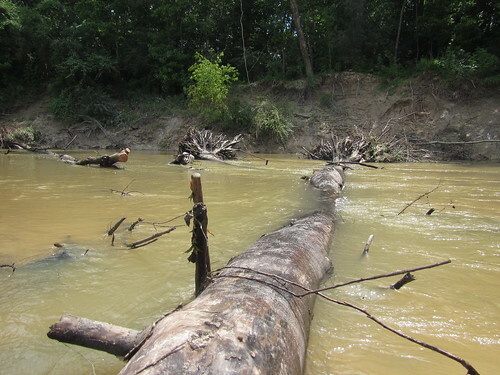 One by one, those limbs gave way before the wonders of razor tooth sawing and were whisked away downstream. In the end, all that remained was one rather large (but not as large) tree trunk on which the main trunk had been resting. It seems to be deep enough not to be a problem, but if that changes, we’ll be back. For now, we’re happy. Where before there was a tree trunk completely blocking the way, now there’s open water perfectly ready for paddling on by. 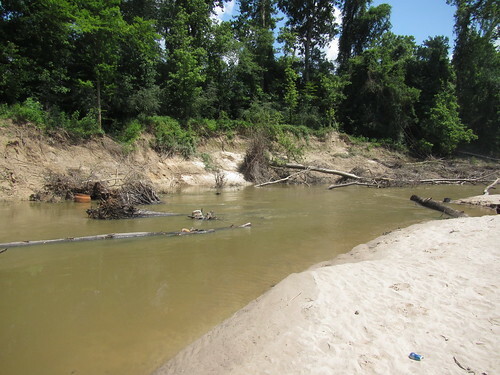 We’re hoping to get some more time paddling the Comite so we can report more accurately on gauge levels versus sandbars, as paddling flowing water is quite fun. With Blackwater and Waddill at the ends of a nice seven-mile run, it’s a great river to spend a Saturday. We don’t want to forget, also, to thank the folks at Waddill for having taken out the large logs/trees that were on the sandbar beach. We’re more than happy to get out in the water with handsaws and manual labor to take out the trees that can’t be handled by a person with a chainsaw, but we’re not much use against larger trees and on land. 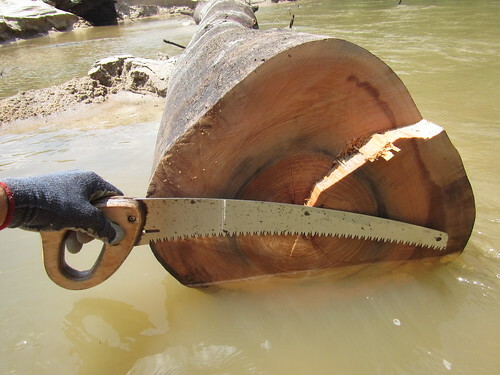 (Cutting up a 20″ trunk with an 18″ razor tooth saw while chest-deep in the current is about our limit.) Thanks for your help, and you’re always welcome to ours.